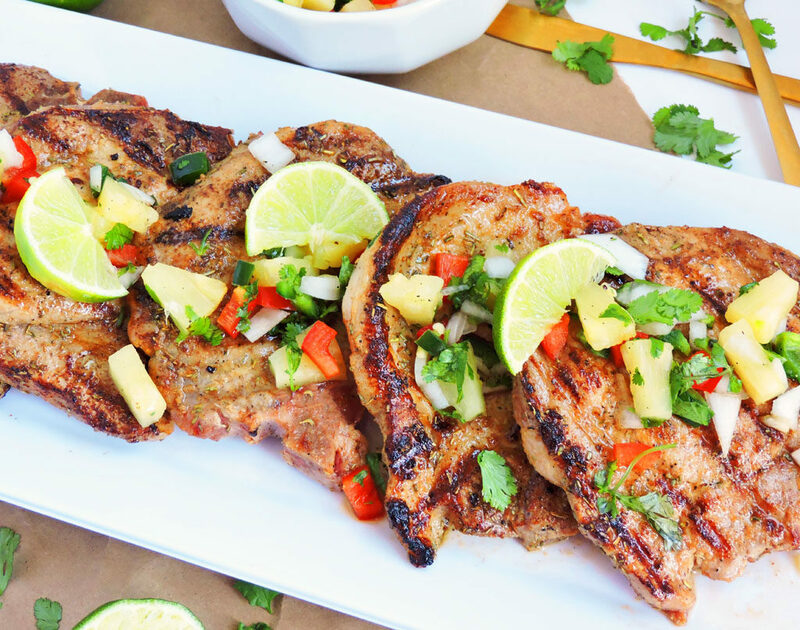 If you’re a fan of pineapples, then you’re going to LOVE these Honey Glazed Pork Chops with Pineapple Salsa! We are well into Spring and I’ve got all of the Spring feels! I’ve been filling my home with fresh flowers and brightly colored décor! 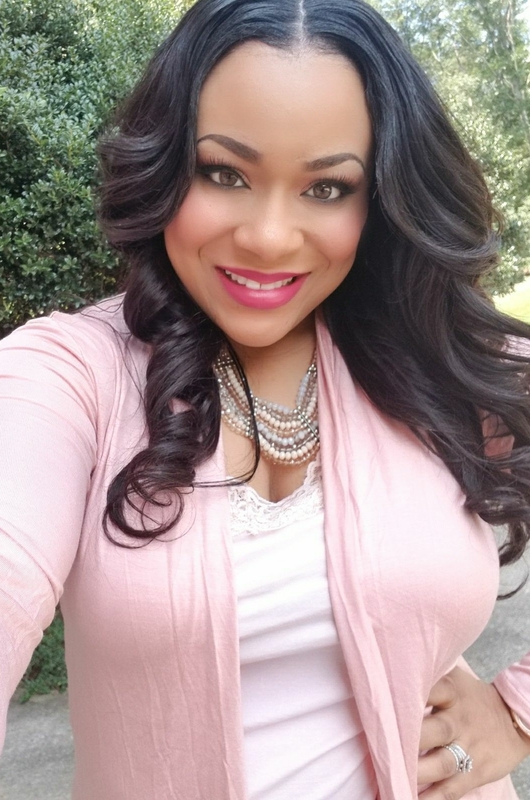 It’s just something about this warm weather that puts me in a cheery mood! In addition to putting flowers everywhere, I love to take advantage of the beautiful Spring fruit! I try to incorporate them into my recipes whenever I can! Pineapple is one of my favorite fruits to cook with! Even though it’s available all-year-round, the peak season is between March-July! I love pineapple because it’s so versatile! It goes well in any sweet or savory recipe! And here’s another reason why I love pineapple…. Pineapple has so many amazing benefits! Pineapple helps to boost immunity and suppress inflammation due to its high concentration of vitamins including vitamin C.
Pineapple aids in muscle recovery. 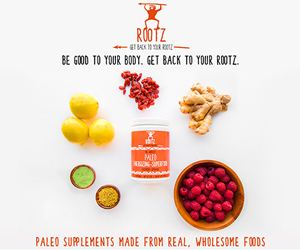 The combination of Bromelain, vitamin C and manganese makes this fruit the perfect remedy for recovering those hard-working muscles. Pineapple helps to strengthen and improve bone health. Pineapple contains manganese which contributes to bone health and helps to maintain healthy connective tissues. One cup of pineapple contains over 70% of the recommended daily serving of manganese your body needs! I’ve always loved pineapple salsa! Ever since I tried it for the first time in Florida, I was hooked! We were in Destin, FL for a work conference and stopped by this Taco Restaurant that had the most AMAZING pineapple salsa! 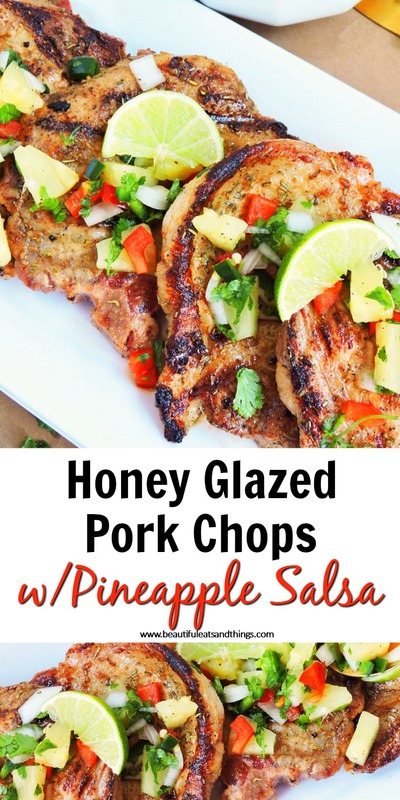 Luckily, I was able to recreate this recipe and decided to pair it with these delicious Honey Glazed Pork Chops! 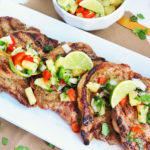 When making this Honey Glazed Pork Chops and Pineapple Salsa recipe, I started by marinating my pork chops for a few minutes. You’ll be pleasantly surprised that the honey provided the perfect flavor without being overly sweet! It balanced those savory seasonings out perfectly! I used my cast iron stovetop grill to cook my pork chops. I LOVE, LOVE, LOVE my cast iron stovetop grill! I received it as a birthday present a few years ago and it’s seriously my best friend! It grills my meat perfectly and gives it those cute little grill marks! While my meat was cooking, I put together my pineapple salsa which only took a few minutes! 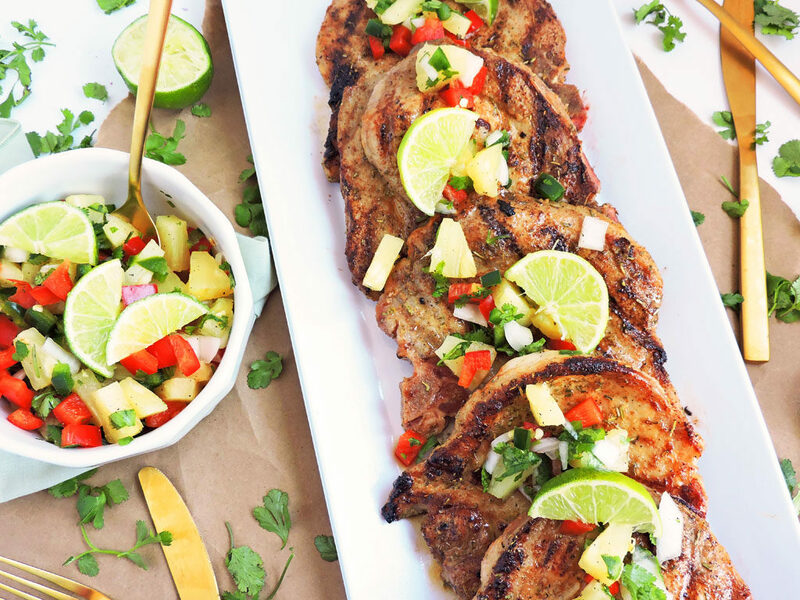 The pineapple salsa paired very well with the Honey Glazed Pork Chops! It provided a sweet and tangy flavor that really took this recipe to another level! I normally eat my pork chops with cooked apples but my new favorite pork pairing is definitely pineapple! 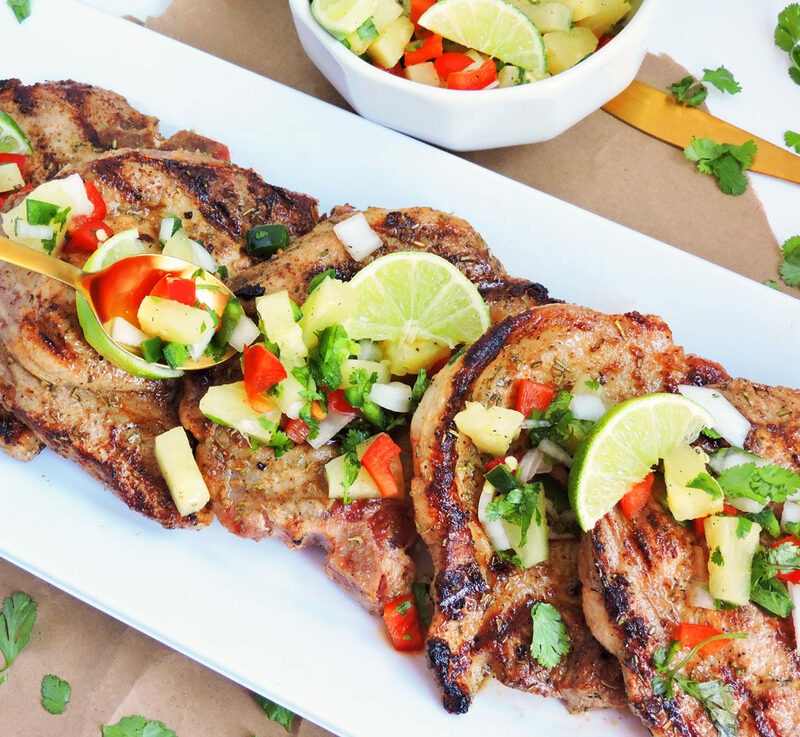 These Honey Glazed Pork Chops with Pineapple Salsa will be on our dinner menu this week! Have you planned your weekly dinner menu yet? Let me know in the comments below! Place pork chops, 1 and ½ tbsp of honey, garlic powder, 1 tbsp of oil, and salt/pepper in a large bowl and make sure that the pork chops are coated with all of the ingredients. Let sit for about 5-10 minutes. 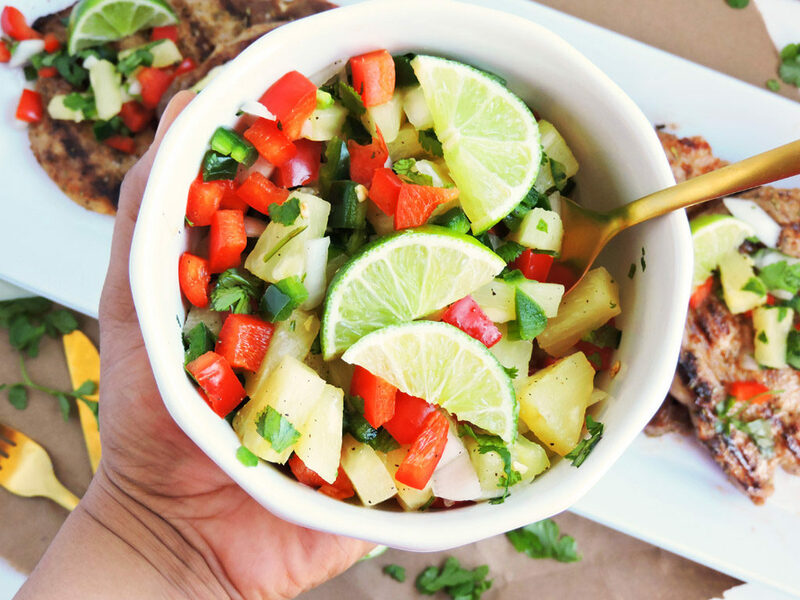 To make Pineapple Salsa, combine 1 and ½ cups diced pineapple, bell pepper, onion, cilantro, jalapeno, and lime juice in a medium bowl. Add salt/pepper to taste. Set aside. Add 2 tbsp of oil to stove-top grill and heat grill to medium heat. 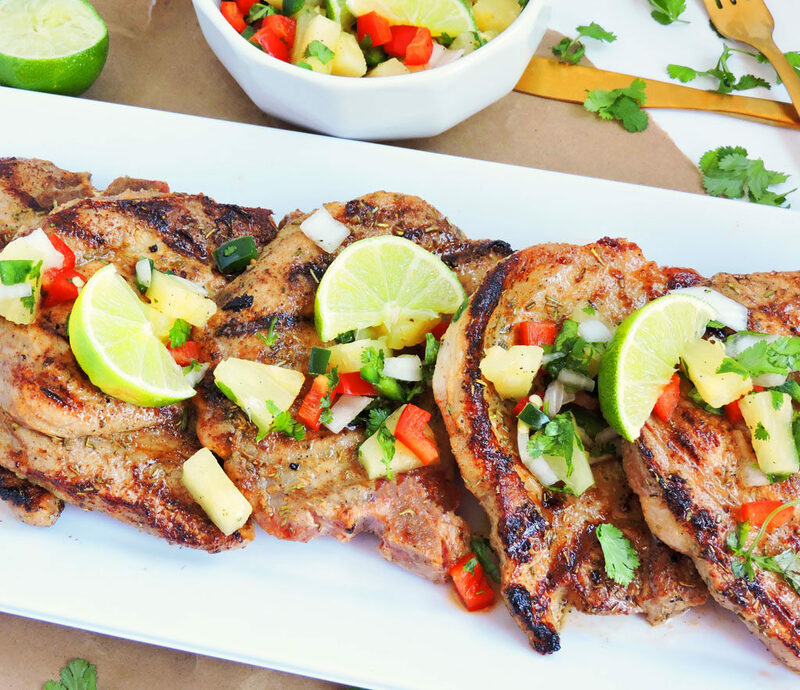 Place the pork chops on the grill. You should hear them immediately begin to sizzle. Cook until grill marks appear, about 3 minutes on each side. Transfer the pork chops to an oven safe dish and place in the oven. Roast the pork chops until cooked throughout. Cooking time will be 8 to 10 minutes depending on the thickness of the pork chops. 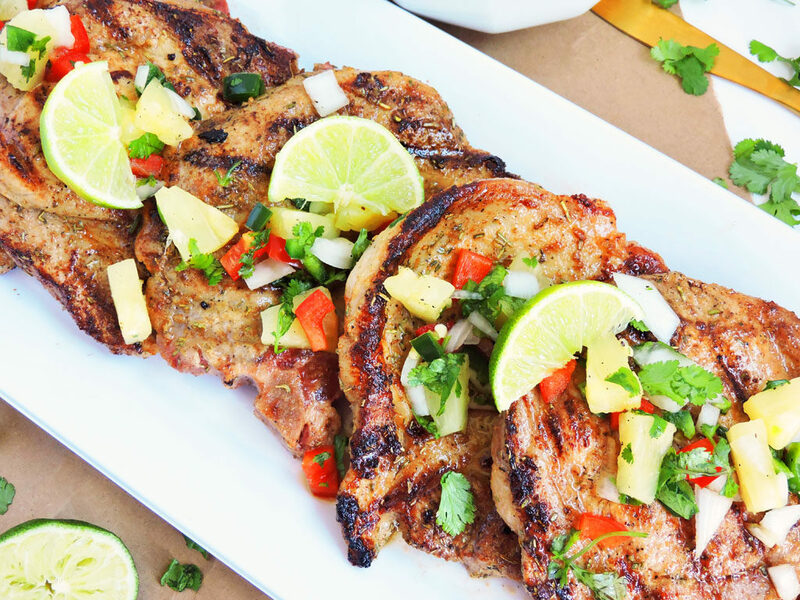 Transfer the pork chops to a plate and pour any pan juices over the top. 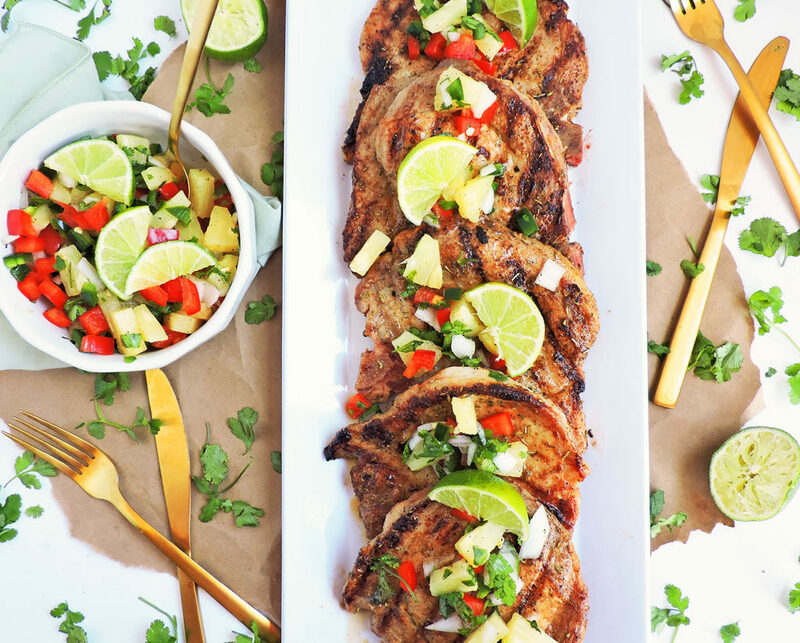 Top with Pineapple Salsa and serve.